With a slow morning chasing deep water perch I was hopeful that things would get better on a new body of water! Our preferred spot was somewhat occupied by a single guy. Wanting to not crowd him, we headed to a second spot that we located last fall in the boat. We ended up with out tip ups spread over 8-14 feet of water that was healthy with milfoil and curly pond weed. As we set our 4th tip up for the afternoon, our 3rd flag tripped. The bass were proving to be aggressive! With what seemed like forever, we finally laid out our 14 trap spread with jigging holes prepped. The fish were hungry so it was a good thing I picked up extra bait! After only a short while, we figured out what depths certain species preferred. 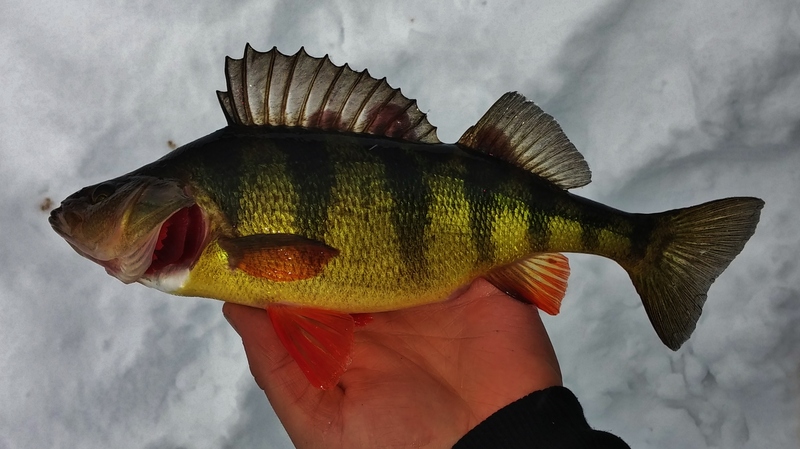 Pickerel were in the 8 foot range, bass were 8-12 and the perch were cruising the deeper end of our spread on the weed edge. The action was steady and very few flags weren’t successful. As evening approached a white out rolled in causing difficulty seeing flags. We spent a little bit more time walking around tending to the flags that were on the outskirts of our visible area. 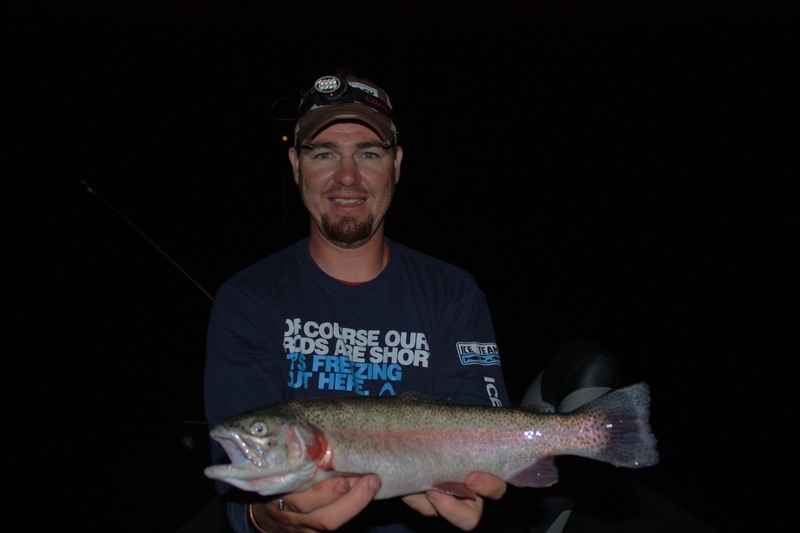 During one of my tending breaks while jigging, I managed to land one rainbow and lose another in the hole while it spun around and around. We were hopeful that some more would hit our minnows but they never did. Just before dark we picked up our gear and made way for home. It was a successful afternoon and it surely made up for the slow morning bite! It’s always tough swallowing a skunk or anything close to it but usually you can find some good out of it. We searched out some new spots today. Spots that in the summer are decent at times but in general only for short time periods. With a mind set that things might be a bust, we made way at well before first light. We caught some crappie and bluegill right off but things really shut off as the wind picked up. With the fishing slowing the final bit of motivation to leave came when a guy started setting his tip ups in the few holes that we had cut. Our second stop for the day was at a local bait shop that we spend quite a bit of time at. We talked fishing, picked up some spoons, and traded some fish tales. From there we sat in the parking lot and made a game plan for the rest of the day. 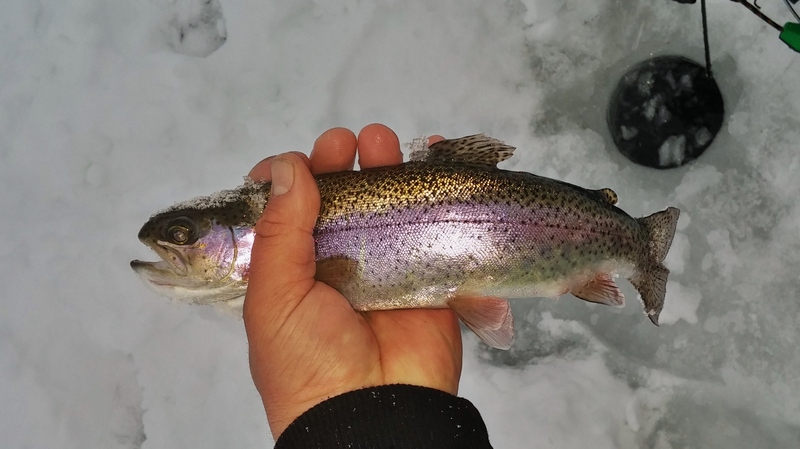 We picked out a few spots that produce decent fish in the summer but we had never set foot on after ice up. We cut apart two more bodies of water before realizing that it wasn’t a day for searching out fish. Either they had gone somewhere completely out of the ordinary or they just weren’t biting. With a lack of hooksets, we decided to head to a deepwater bluegill lake that rarely disappoints. After making the mile walk to the desired hump, we cut out a large area that they usually roam through. 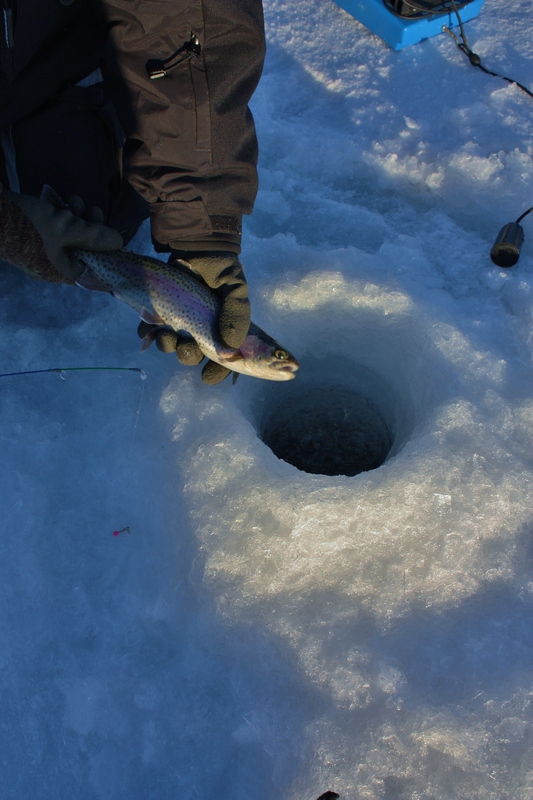 With holes ranging from 35 up to 11 feet of water we began fishing. The marks were present and aggressive. The first few fish that came up were bass. Within a few holes though we had found gills. The problem was they were small. Fishing about 20 feet from my buddy Andy, my Vexilar let up with 16 feet of fish in 35 feet of water. Confused I asked him what he was seeing. Soon enough both of our graphs were stacked up. He sent his underwater camera down surprised to see thousands of gills stacked top to bottom. With bigger ones in the mix we picked away until we got frustrated. Occasionally, we would pluck and aggressive largemouth of rainbow cruising through the bait. With out heads sore from scratching, we packed up our gear and headed back to the parking lot. The whole day was strange and I think we can contribute most of the lack of fish to an off day. Certainly, we can’t give up after just one bad trip! It had been a while since I had been on the water with my dad but with plenty of time to spare at camp while at our family week, we were able to get on the water. We began the day at sunrise with a very pitiful attempt at catching bass. Neither of us were sure why it was so slow but we figured that we would try to salvage the day with a night Hydro Glow session for trout. With my mom, dad, girlfriend, and dog in the boat, we putted around the lake looking for fish on the graph. It didn’t take long to get over them so we anchored up, submerged the lights, and I explained how things would work. It is a pretty easy system and before putting the first marker on Mary’s line, we had missed a fish. After we were all set up, we started picking at the bluegill. It wasn’t for a bit that a few trout made their way in the boat. The bites were very light and quick. I don’t remember any fish coming back for a second taste. Maybe they are accustomed to the glowing light or maybe things just slow down as the water warms. 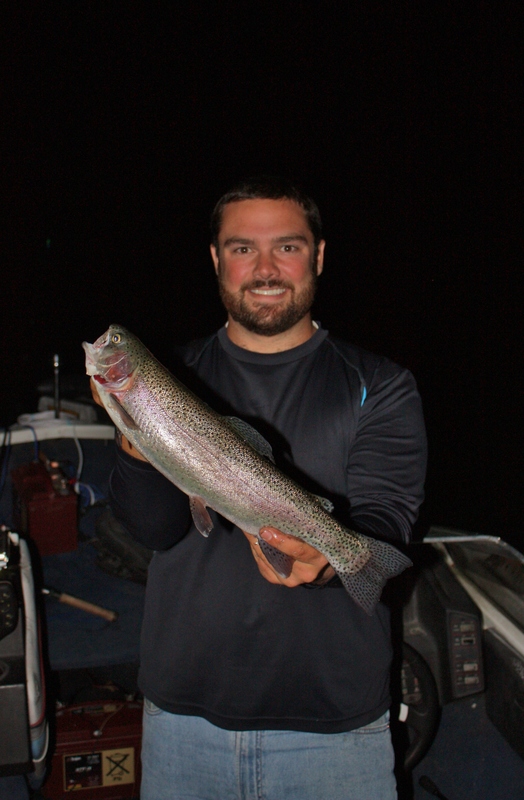 By the end of the night, we had a few good rainbows to go on the smoker and released about a dozen bluegill. My mom didn’t fish but she kept us informed on where the fish were cruising through on the graph. It was fun to have them all out with me and they were happy to see what it was all about! 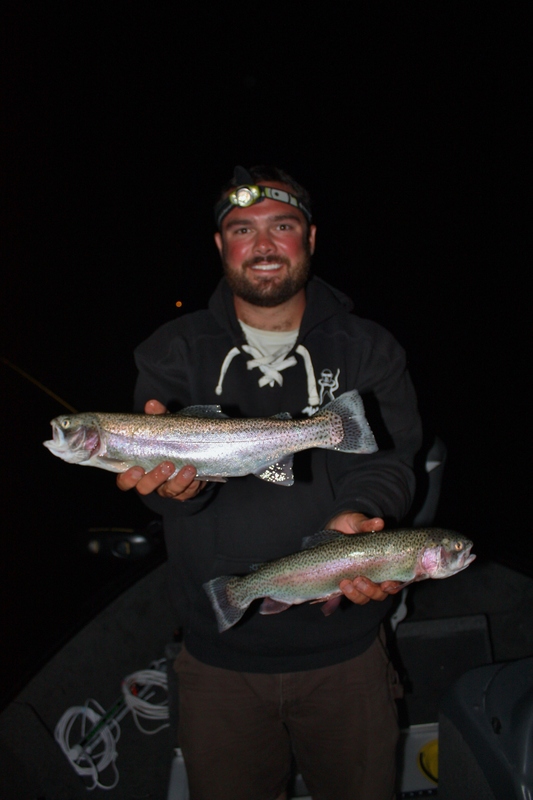 Bobby and I had a chance to hit the water again tonight with the Hydro Glow Fishing Lights. 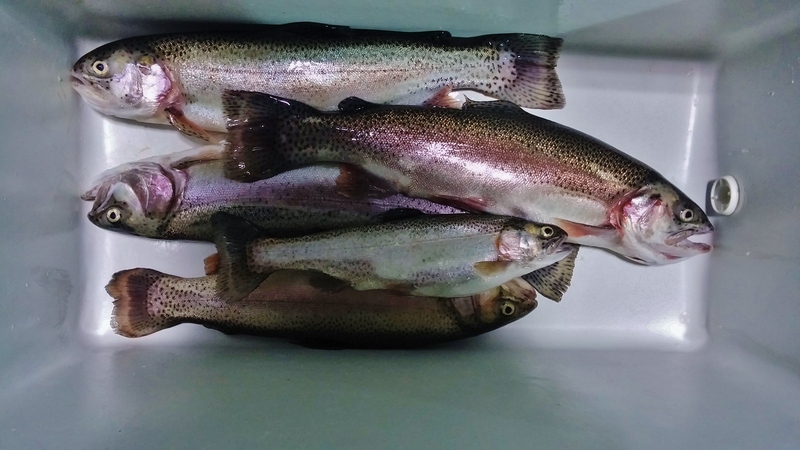 We had a mission to bring home some rainbow trout to put on the smoker. With pleasant weather above, it was go time at dark. We set up over 29 feet of water after we found a decent concentration of fish. The fish were cruising the bottom half of the water column before dark but within about 30 minutes of submerging the lights, the fish tightened their corridor to only the bottom six feet. As usual, we ran 1/32 and 1/16 ounce jigs tipped with crawlers. After locating bottom and staggering our baits through the active zone, we waited. The bites were constant throughout the night but the hook ups weren’t. In general the trout bite like regardless of their aggressiveness but this was different. Most times, a short striker can be enticed for a second round with slight jigging. This theory was thrown out the door though. 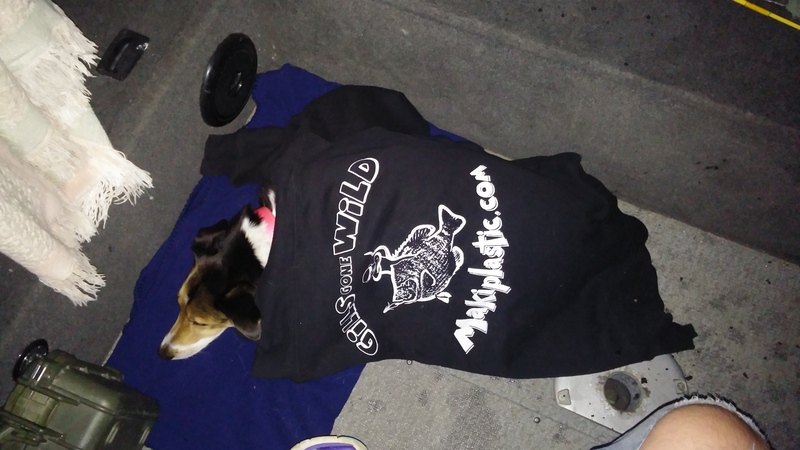 It was just a tough night of fishing. We ended up bringing home 5 of the smaller fish for a future day of running the smoker. We were on the water with a good bit of time before it was dark so we putted around catching some panfish and bass to pass the time. 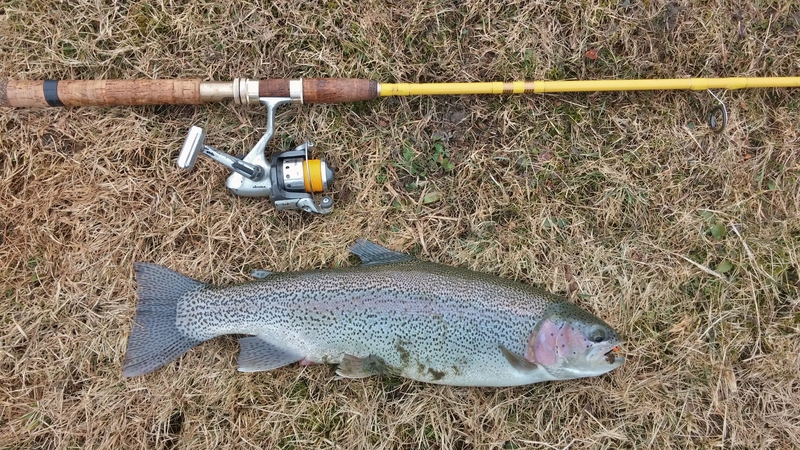 As the clocked ticked 8, we began searching for the depth the trout were running at. We located them in just over 26′. After passing over several small pods in a small area we anchored up and dropped the Hydro Glow Fishing Lights. 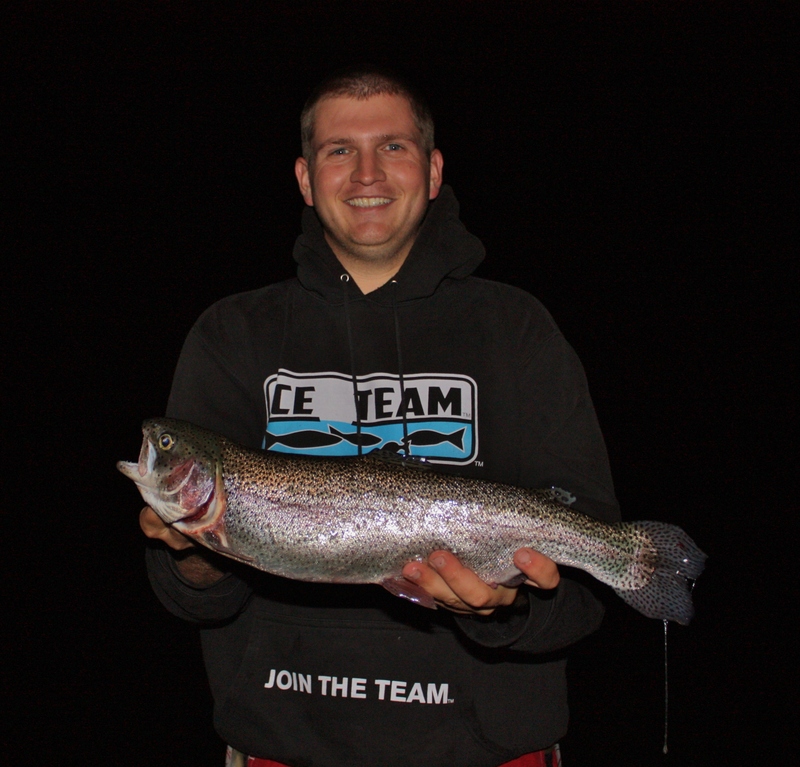 The fish started biting right after the lights were on but things really picked up after it was completely dark. After the sun set there was a wicked hatch of hexagenia. 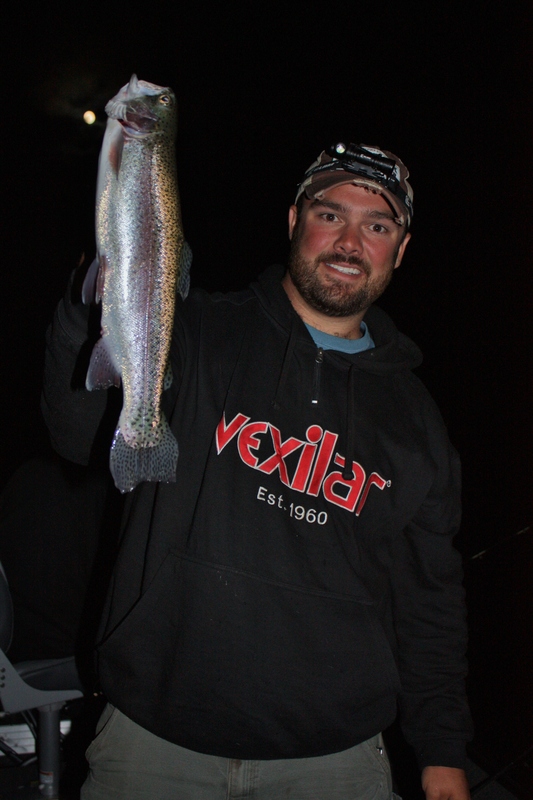 The trout were crushing them everywhere including right over the side of the boat. We got to see a ton of fish throughout the hours that we were out. 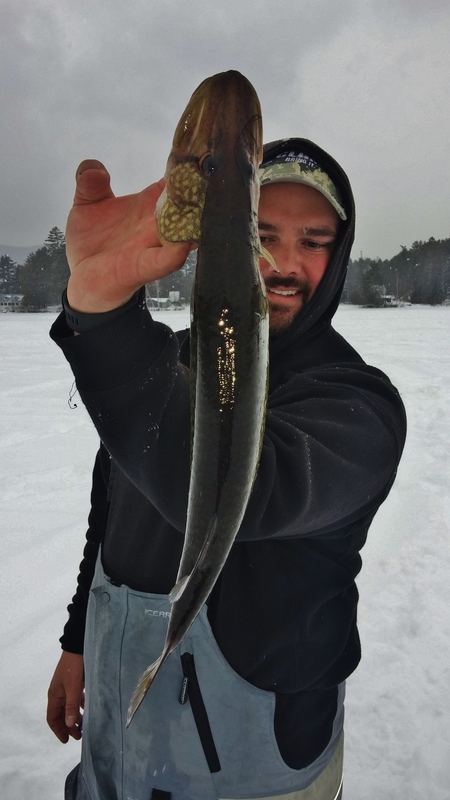 On average, the fish that we catch are 14-16″ with a few bigger and smaller. Tonight the average size seemed to be 19-21″. Certainly nothing to shake a stick at! 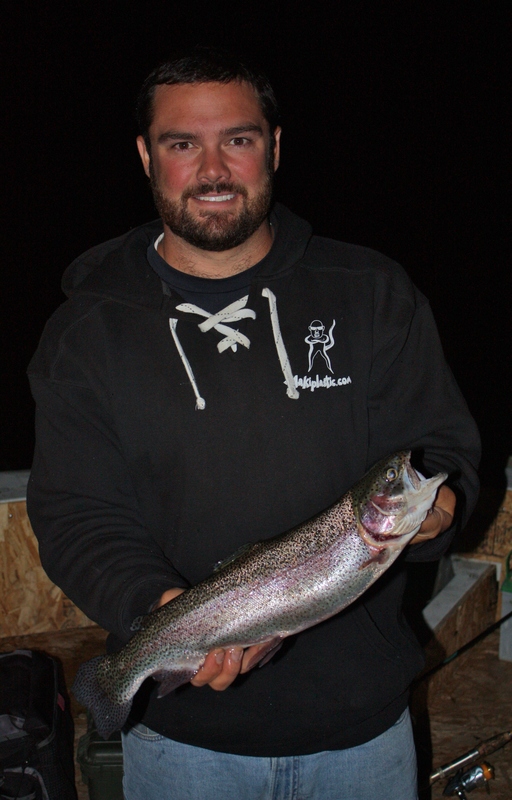 The fishing stayed steady until just after 1 am. After about 30 minutes with no fish, we decided to pack it up and head home. The blog has taken back seat recently. Sure there has been a few fishing trips but with a new house and a need for firewood, time has been short. Most of my time on the water lately has been at night. 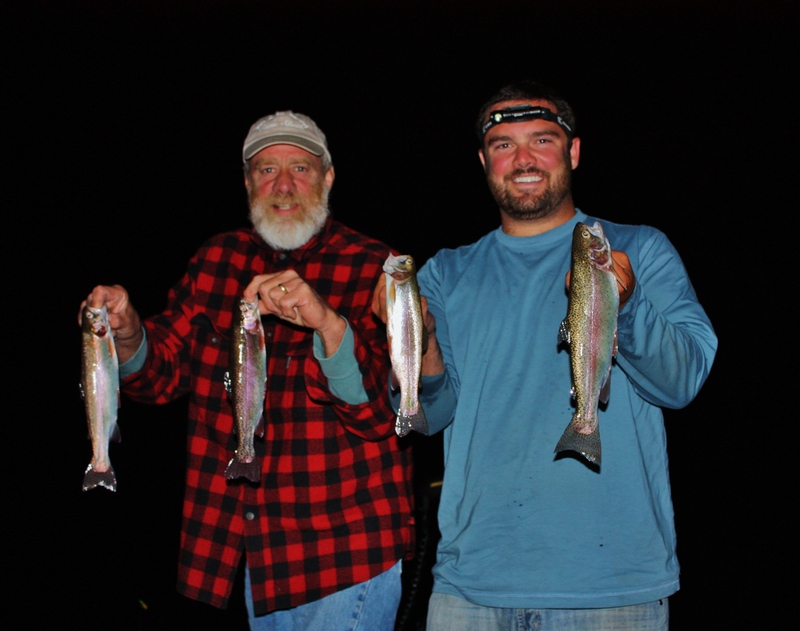 I went out with two buddies who had never fished trout at night. The moon was going to be full which was ideal for hitting them after dark. 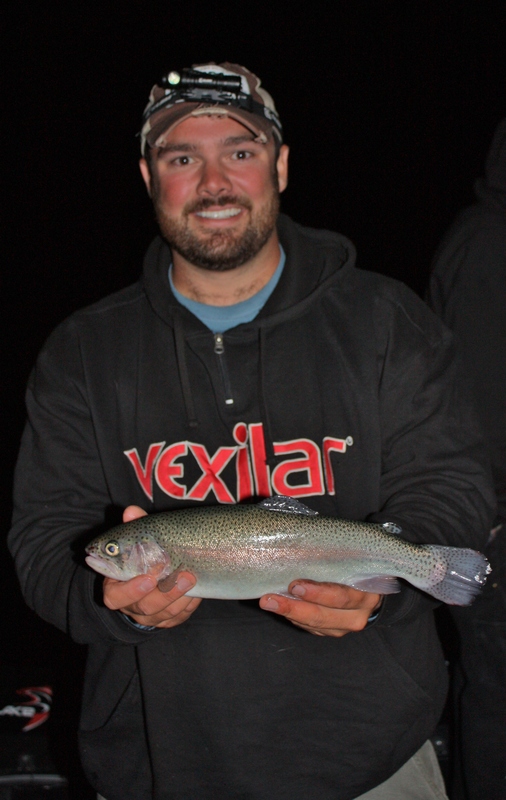 We began the night with 1/32 and 1/16 ounce jigs tipped with crawlers. 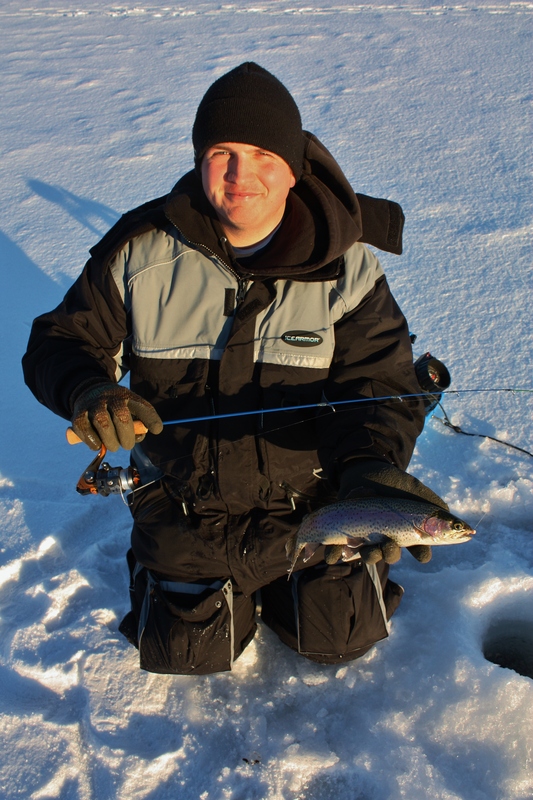 We staggered lines in hopes of finding a consistent depth that the rainbows were running at. Setting over 31 feet of water left plenty of area to cover! Once the Hydro Glow Fishing Light was submerged we began to talk fishing. Having an organized boat makes fishing at night easier. Having to retie, the need for forceps, or getting the net are all routine things that can easily be complicated if they are not in a designated area. After explaining my game plan, we wet a few lines. The fish came through in spurts and were for the most part willing to bite. 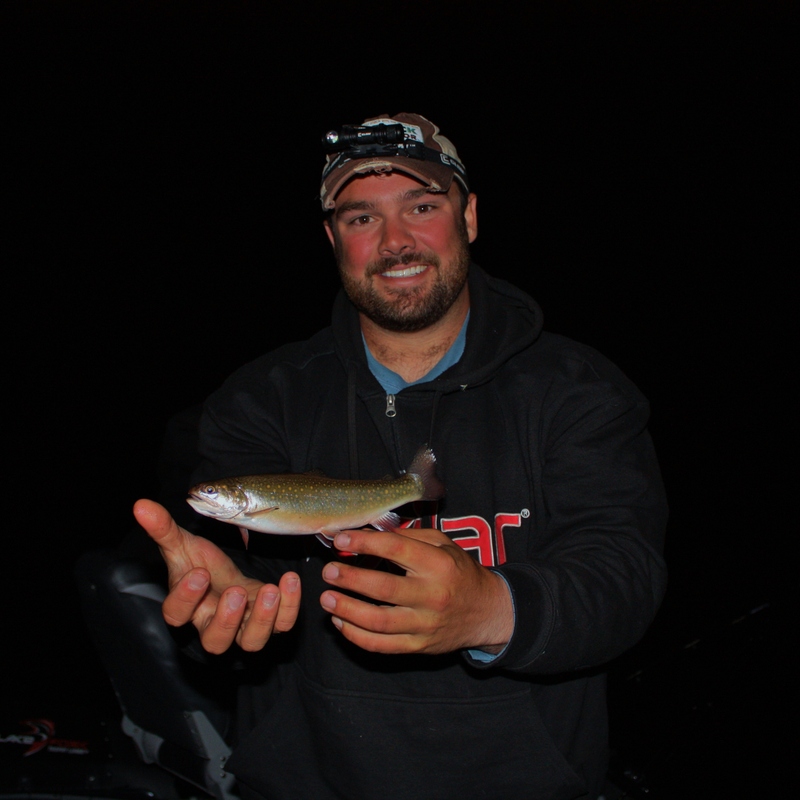 While most bites occurred while the jig was still, as the night passed by, light jigging started to produce more and more. 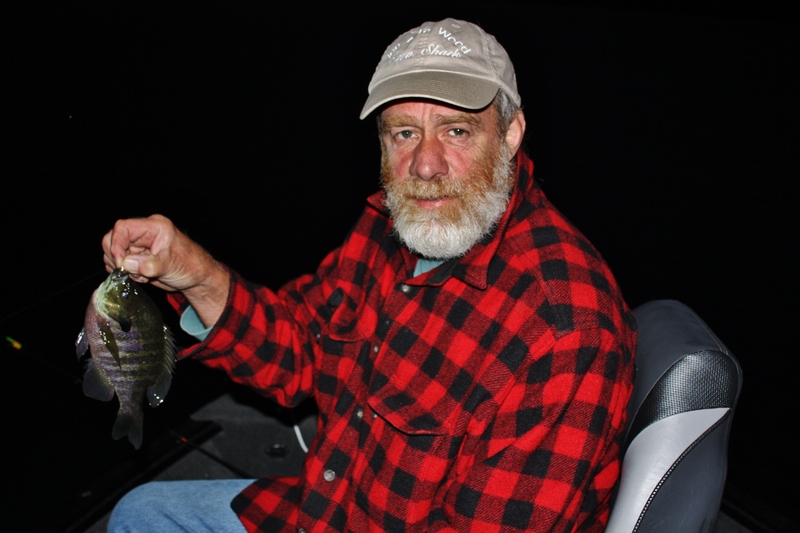 With three of us in the boat, we were able to have confidence in our patterns on what the fish preferred. After several hours of fishing, things slowed down so we decided to pack it up. We all caught fish and it was well worth staying up late. When it was time to back the trailer in, some yahoos had left a present in the form of glass liquor bottles behind my tires. Awesome way to end the night! 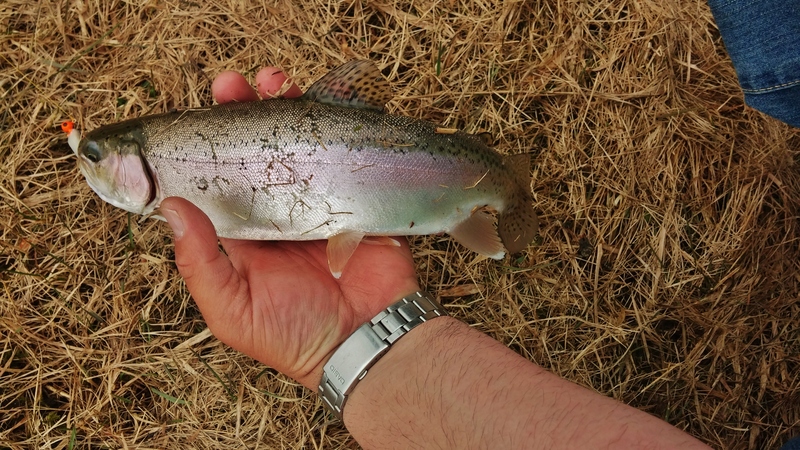 Trout can put up a good fight on any day but add a little fast moving water and you have a recipe for quite a battle! Today was a quick trip as there was a sever rain storm coming in later in that day that would raise the already high water. I was on the water for a few hours in a spot that has been good to me in the past. There is quite a variety of habitat in the vicinity and I chose to fish an eddy. Because of the high water, I was standing on the edge of a field! I was tossing a “Live” Baby Shad from Lake Fork Trophy Lures on a 1/8 ounce jig head. After giving the jig a few seconds to sink, I would start working it back through the slack water with quick and erratic popping action. The bites were relatively light but firm enough for a good hook. I landed 6 fish total and lost two others that got out into the main flow. 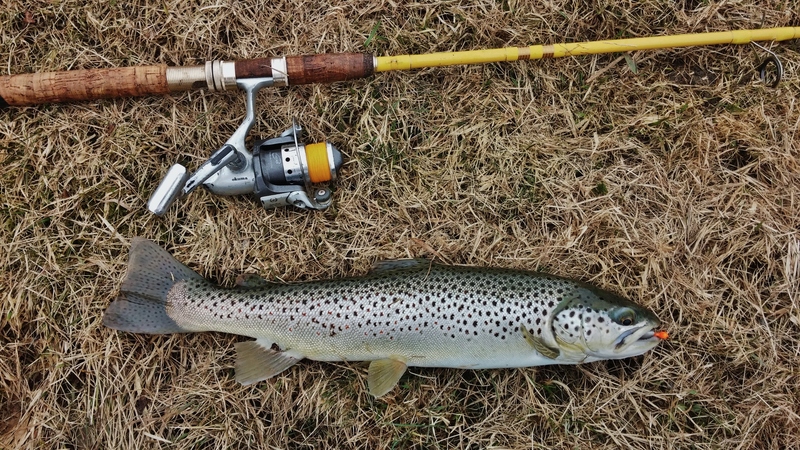 Although not measured, big fish was a rainbow around 20 inches followed by a 16″ brown that was super slender. I see a good summer ahead on this river!